Honey It's Cold Outside! How Bees Survive the Winter. For many animals and insects, winter is the time for them to find a nice cozy place to snuggle up and hibernate. But for honeybees, the winter is just another day in the hive. How in the world do they survive the cold, you might ask? Well, let’s find out! In northern states, honeybees go into what is called a dormant state in the winter. They aren’t hibernating, but they aren’t as active as they are in the summertime. During the spring and summer, worker bees are busy making extra honey and storing it away so they have food for the winter. When the cold arrives in October or November, the worker bees kick all the drone bees out and let them die. They do this because the drones didn’t help them make any of the honey, so why should they get to eat it? Then, the worker bees form a large cluster around the Queen bee to keep her warm. The bees on the outside work their way to the inside and the bees on the inside work their way to the outside. Honeybees even shiver to make heat! All the moving around keeps the inside of the hive at a constant temperature of about 92 degrees! They use all the honey they stored during the spring and summer as food during the winter. Some beekeepers who don’t want to leave their bees in the snow for the winter will move their bees to warm states like California, Texas and Florida. Beekeepers who do this are called migratory beekeepers. 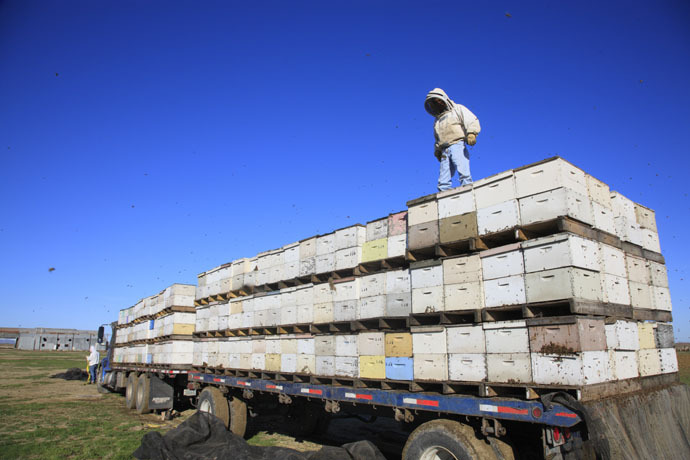 They transport their hives to warm places so they can do an extremely important job called pollination. Beekeepers are paid to have their bees pollinate crops such as almonds, oranges and grapefruits. If those types of crops don't have honeybees for pollination, they wouldn’t make any fruits or nuts. Can you believe that honeybees pollinate about 90 different crops? Not only do they provide delicious honey for us, honeybees are an invaluable resource to U.S. agriculture. On these cold, winter days when all you feel like doing is sleeping, just remember that even honeybees stay busy in the wintertime!